Not interested in Ketchum ? Please choose a different community. 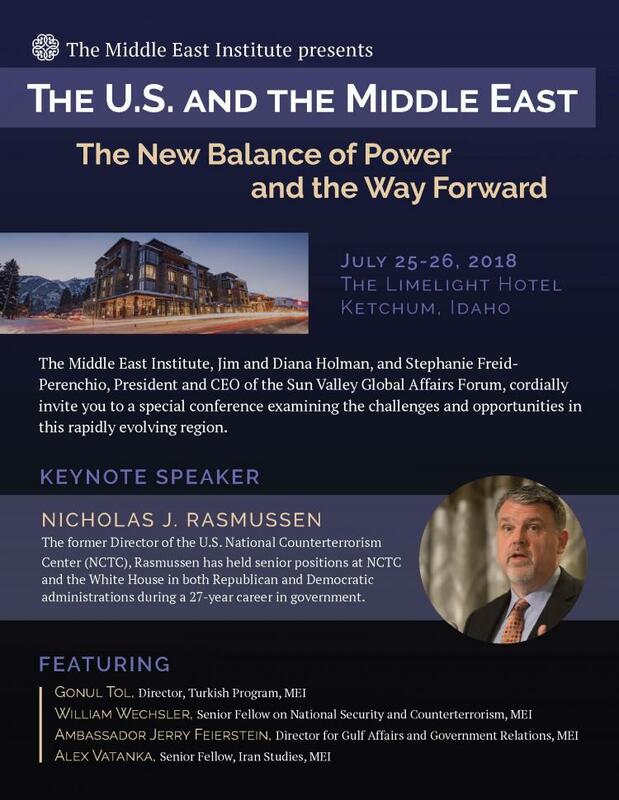 On July 25, 2018, The Middle East Institute, the preeminent Washington DC policy center on the Middle East, will bring Nicholas Rasmussen, former Director of the U.S. National Counter Terrorism Center (NCTC) to the Limelight Hotel in Ketchum for an in-depth conversation. Rasmussen held senior positions at NCTC and the White House in both Republican and Democratic administrations during a 27-year career in government. He will share insights on the state of our national security, counter-terrorism efforts, and Middle East trouble spots including Iran, Iraq, Syria, and Afghanistan. The following day, July 26, experts from The Middle East Institute will join Rasmussen for conversations on the U.S. and its changing relationships with key regional powers including Saudi Arabia, Iran, and Turkey as well as a discussion on how terrorist networks operate through banks and financial institutions throughout this volatile region. Tickets are $450 for individuals and $750 for couples and include admission to all sessions, receptions, and breakfasts. Register here. For information, contact Hayley Smart at The Middle East Institute at 202 785 1141 extension 209. The Middle East Institute (MEI) is a Washington DC-based educational and policy institute. Founded in 1946, MEI is an unbiased source of knowledge and analysis on the Middle East.